Ever Africa invests in ventures in the ICT space in Africa, with an emphasis on applications that have a positive social impact in the telecoms, media and security sectors. It was started by Sibella and Alan Knott-Craig Jr in early 2013 as a vehicle to pursue their respective passions of using technology to make Africa a better place in a commercially sustainable way. Their latest mobile app Namola, is a security application which aims at use of mobile technology to fight crimes in City of Tshwane. This free application has empowered GPS enabled Android smartphone or tablet users to directly send alerts to the nearest Tshwane Metro Police respondents and request for assistance. 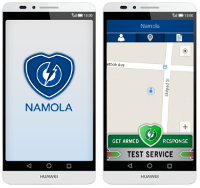 Namola was introduced to work as a medium for South Africans to send alerts directly to the nearest armed responders using their GPS enabled smartphones. These armed responders from Tshwane Metro Police are equipped with Huawei sponsored Android smartphones mounted on dashboard to receive any assistance alerts. The deployed smartphones were capable of performing like any other normal smartphones, which increased the probability of shift in responders' focus to unwanted activities on the device rather than the task at hand. Ever Africa was also concerned about cost related to the extensive usage of mobile data by the responders' unmonitored online activities. Ever Africa was looking for a solution which could ensure that the responders focus only on the intended purpose of receiving alerts sent using Namola. Ever Africa did a comprehensive search for a solution online and on Google Play Store and found SureLock to be the perfect solution for locking down the armed responders' devices to only those applications required to communicate with Namola. Surelock was also easy to install, rich in features and cost-effective. With Surelock, Ever Africa was able to provide all responders with smartphones without worrying about what the phones were going to be used for. It gave them the ability to focus completely on the application and the task at hand. Ever Africa also found SureLock simple and easy to use. Once the application was installed, activated and required applications allowed, the Android smartphones were all set to be deployed for Tshwane Metro Police. SureLock gave Ever Africa a comprehensive solution to ensure that all the devices were used only for intended purpose. It was key to the success of their project and helped them take a major step towards making a positive social impact. "SureLock provided us with a great solution to manage the devices used in Namola. We are now confident that the devices are secure".